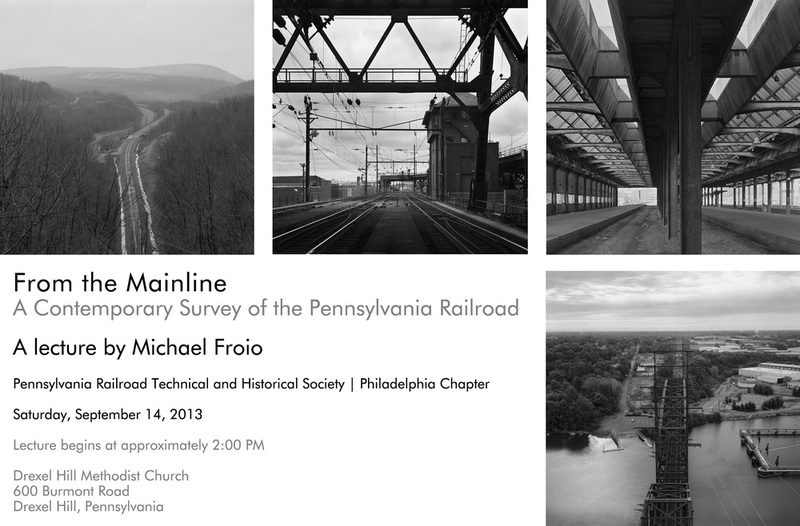 I am happy to announce that I'll be presenting a slide show and discussion on my ongoing photographic project, From the Main Line: A Contemporary Survey of the Pennsylvania Railroad for the Philadelphia Chapter of the Pennsylvania Railroad Technical and Historical Society. Inspired by the work of photographer William H. Rau, who was commissioned in the 1890's to document the PRR and its destinations, the project explores the transitioning landscape along the former PRR Main Line from New York to Pittsburgh, highlighting the unique vernacular of facilities and infrastructure built by the PRR. Using large format film based images this project combines historical research and imagery to present a creative documentation of one of the most celebrated railroads in American history for both exhibition and web format.